Five friends, ages 18 and 19, handed out cards at the second Decision America stop in Pasadena about how people can pray for California. From left to right: Mia Battaglia, Carson Inouye, Brayden Martino, Charlie Battaglia and Vincent Rodriguez. It’s easy to get stuck in a Christian bubble, surrounding yourself with people of the same nationality or age group. But the Bible says to come together as believers, which includes every variety, Rashelle Nagata said. Rashelle and some friends joined about 4,700 people Monday night in front of the Rose Bowl for Franklin Graham’s second stop on the Decision America California Tour. 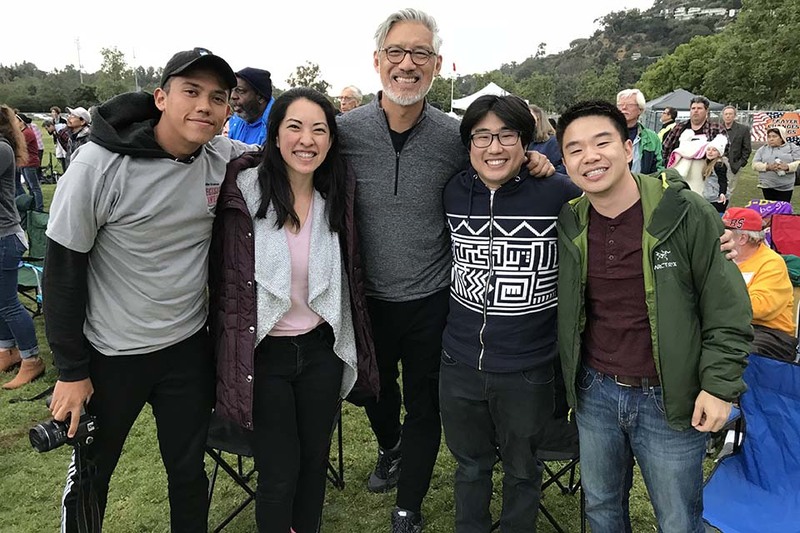 As a Hawaiian who attends a largely Asian American church, Rashelle was thrilled to be in such a diverse crowd full of people who want to have a lasting impact on the spiritual landscape of California. Diverse not only in race but also in age. “It kind of seems like our generation dropped the ball on evangelism,” her friend, 26-year-old Sam Meng said, as he thought about ways to personally carry the torch. “I want to see my generation want to do something” to further the Gospel, he said. From left to right: Andre Leander, Rashelle Nagata, Pastor John Lo, David Kim and Sam Meng. All attend Epicentre Church, where Lo is lead pastor. 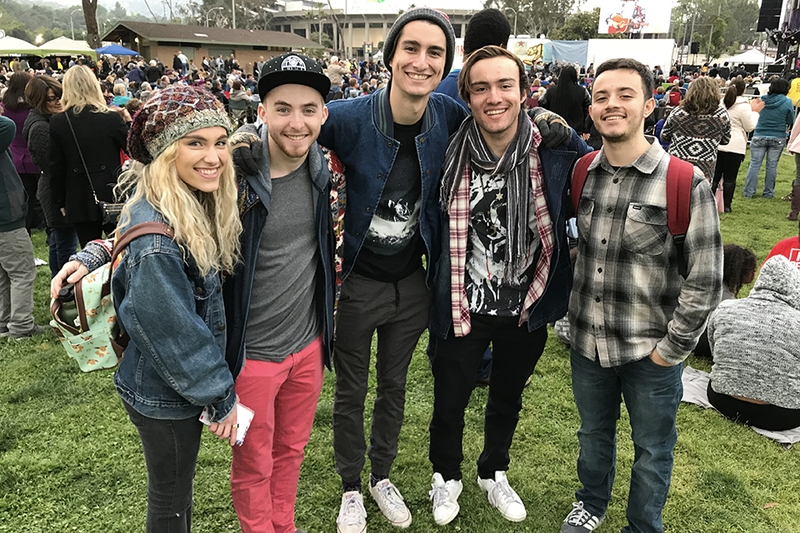 Across the Rose Bowl Lawn, five teenagers were taking a first step by passing out cards specifying how people can pray for California and, ultimately, point others to Christ. All five attend Brand New Life Christian Center in Orange, about 45 minutes south of Pasadena. For Charlie’s 18-year-old sister, Mia, this year marks the first time she can vote. She held a stack of prayer cards with one side detailing how people can vote in California’s June 5 primary—the same day the Decision America California Tour ends. As the night grew dim, homes on the side of a hill overlooking the venue began to light up, a yellow glow coming through their windows. 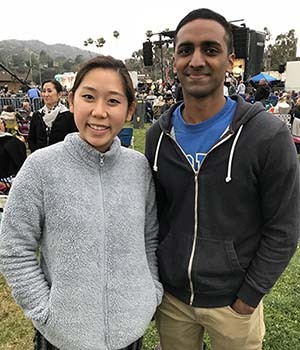 While so many come to California—and the Los Angeles area in particular—to chase dreams and find a better life for themselves, Rashelle’s friend David Kim said, they’re often met with disappointment. 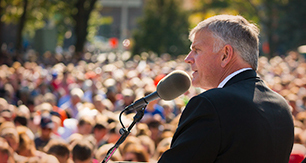 Hear a short clip of Franklin Graham’s message in Pasadena. Franklin shared a story from his early 20s when he wanted to party and live his own life, but was met in the end with emptiness. UCLA senior Tess Chen is part of PIHOP, the Pasadena International House of Prayer. “I just want to meet Jesus here,” Tess said at the Decision America Tour. She brought along fellow chemical engineer major Ramu Bedekar. Franklin read a passage from 2 Chronicles 33 in the Bible about King Manasseh of Judah. The king did evil in the eyes of God and greatly misled the nation. It was only when he humbled himself before God, rid God’s temple of idols and repented of his sins that he was forgiven and restored to God. Manasseh may have rebelled and done terrible things, yet God was ready to forgive it all, Franklin said. And He’ll do the same for anyone who seeks genuine forgiveness. It’s that same God, he said, who out of His love sent His own Son, Jesus Christ, to save us from our sin. “So what hope do we have? Our hope is in God’s love,” Franklin said. Moments after Franklin’s message, 19-year-old Charlie Battaglia shared his takeaway: that God can use anybody, just like King Manasseh. And just like him. The Decision America California Tour continues through June 5. See the remaining stops, and learn more about the Pacific Northwest Tour in Oregon and Washington this summer. Pasadena, home of the Rose Bowl, sits about 10 miles northeast of Los Angeles. 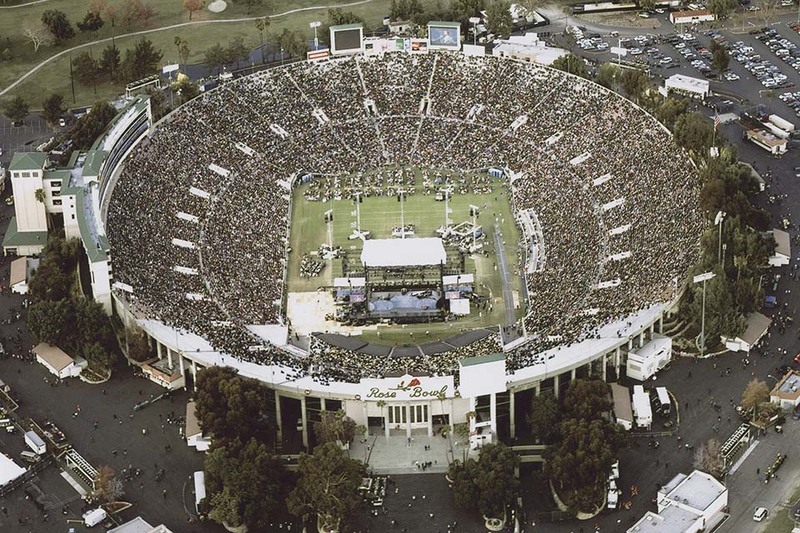 In 2004, Billy Graham, at 86, preached at the Rose Bowl during his Los Angeles Crusade.